Linda Lou Larson, resident of Miller’s Lake, Alberta, passed away on June 18th, 2018 in Edmonton, Alberta at the age of 58 years. Linda was born on September 4th, 1959 to parents Ray and Violet Gideon and was raised in the Edson area where she resided at Miller’s Lake for her entire lifetime. She was the owner of Yellowhead Vacuum Trucks in partnership with her sister Terry Gideon. 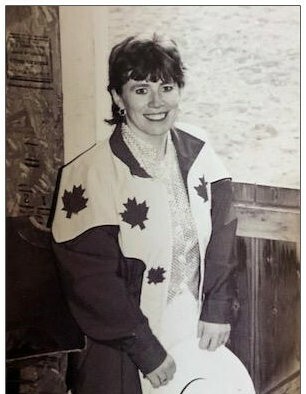 Linda was the Barrel Racing Director of The Wild Rose Rodeo Association for years; she was loved by the rodeo and barrel racing community. On March 11th, 1988 Linda married Dale Larson at Miller’s Lake, Alberta. Linda will be lovingly remembered by her husband of 30 years Dale Larson; son Nathan (Tessa), along with grandchildren Lily Lou & Gunnar Ray Larson of Miller’s Lake; daughter Carmen Larson (Jason Leggett) of Miller’s Lake; parents Ray and Violet Gideon of Miller’s Lake; siblings Wayne Gideon, Terry Gideon and Nola Gideon. Linda was the pillar of her immediate family and was the best mother and grandmother – she was celebrated and loved by everyone who knew her. A Celebration of Linda’s Life will be held at the Edson Royal Canadian Legion on June 25th, 2018 at 1:00 P.M.
As an expression of sympathy and in loving memory of Linda, memorial contributions may be made to the ICU Unit of the University of Alberta Hospital in care of Foothills Memorial Chapel – Edson Funeral Home P.O. Box 6358 Edson, Alberta T7E 1T8 or can be made in person at our office located at 5040 6th Ave. Edson, Alberta. Foothills Memorial Chapel ~ Edson Funeral Home have been entrusted with the care and arrangements (780) 723-3575.